Congratulations to Ph.D. candidate Prentiss Dantzler, Rutgers University Camden, Department of Public Policy and Administration, for achieving the 2nd best conference poster award at this year’s APPAM Fall research conference in Albuquerque, New Mexico! Page last updated by CURE at 12:05 pm November 13, 2014 . 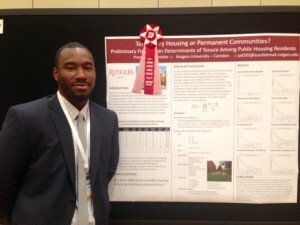 This page was printed from http://cure.camden.rutgers.edu/2014/11/13/prentiss-dantzler-wins-2nd-best-appam-fall-conference-poster-award/ at 8:58 AM Saturday, April 20, 2019.